I've always used transparent ,arterial goggles. And the only problem is that they fog up > so I was thinking mesh. What do you guys recommend? Is it worth the investment into a pair of mesh goggles. (I do have transparent material ones already) the mesh things are quite cheap, and I'm all about the cheapness. So anyone can say its worth it? Also, if anyone has a pair of goggles, that are mesh, could you take a pic of them inside, so I could see what they'd be like if I was looking through them. That'd be awesome. Get a set of Herosharks. mesh is cheaper but don't buy cheap mesh if that makes sense? I used to always wear glasses and hated mesh as it made the world darker and my eyelashes poked through the holes which did my head in, but recently I have gone back to mesh as I was having mega steaming up issues which were ruining my game days. I have a pair of Nuprol mesh goggles which are comfy but are very dark, just ordered a pair of Herosharks as the holes are larger so am hoping they are less dark. For the darkness thing, here's a comparison between some cheap mesh goggles and some Herosharks. Notice the herosharks have larger holes, so I imagine the darkness issue shouldn't be much of an issue. Thanks, where did you guys buy from? Still recommending these too? I was planning to buy some for CQB. They're good too, they are a bit bulky but will completely protect your eyes from rogue bb's as its full seal. I bought one of these as a back up pair of goggles but have not used them yet. The full seal is good. Vision is better than the small circular mesh type goggles but even the larger mesh can still cause some focus issue depending on eyesight. As long as You still have something to look with. Personally, i'd never get a mesh goggles. Decent goggles are ~50 quid, eye surgery is much more expensive. But i'm just saying. The issue I had with Herosharks is the inside is unpainted(at least on the 2 pairs i've owned) and my eyes keep trying to focus on the metal. I'll probably give them a light coat of spraypaint at some point, as they are it's completely unusable. When you are wearing mesh, your eyes attempt to remain focussed beyond it, which means that whatever you can see of the mesh between your eyes and their point of focus is very blurred and, if it is small enough, it disappears completely. The threshold for this seems to be about 1.1mm, ie if any dimension of a shape of metal is longer than 1.1mm, then it will never completely disappear from your view and will instead leave a very blurry dot of shadow (and since they come in rows there will be rows of these blurry dots of shadow). This is where Herosharks fail - the quasi-triangular shapes left between the offset perforated holes leave about the worst rows of shadowy dots. Still, your eyes will refocus, whereas fully fogged/rained out polycarbonate is a trip back to the safezone hoping you don't fall over something in your path on the way. In my experience mesh made from interwoven wires, like those Kingrin's, makes the smallest shadows and they can completely disappear from your view. However, in the Kingrin's I personally bought from firesupport.co.uk, the mesh was pretty badly inserted into the frame - there are many of the last bits of wire missing so there is less substance actually holding the mesh in place than there ought to be, which does make me question their safety. The same style ACM ones, like these, have never given me any pause and i have been shot in the face full auto whilst wearing them at least 4 times. You could also consider doing what I did to a pair of polycarbonate lensed goggles which fit your face well - swap the polycarbonate for mesh you buy yourself. You can then bend the end of each wire to loop around the last wire it crosses, or a boundary wire, to form the edge of the mesh insert. This adds strength because it means that the wires cannot be pulled into the centre of the mesh by deforming pressure - if the wire cannot move, the only way to deform the shape of the holes and thus penetrate the mesh, is to actually stretch the wire - personally i do not believe it is possible for an AEG, BASR, gas or even HPA, propelled plastic BB's to deliver enough energy to a hit to actually stretch 0.7mm steel wire, especially when it is also supported by the friction between each crossover. I also added to the strength of mine by making the mesh replacement bulge out way more than the original lens did, which gives the shape more room to flex and spring back than if it was simply flat. ...when I'm wearing these, it only takes seconds before it feels as if there is nothing at all between my eyes and the world. 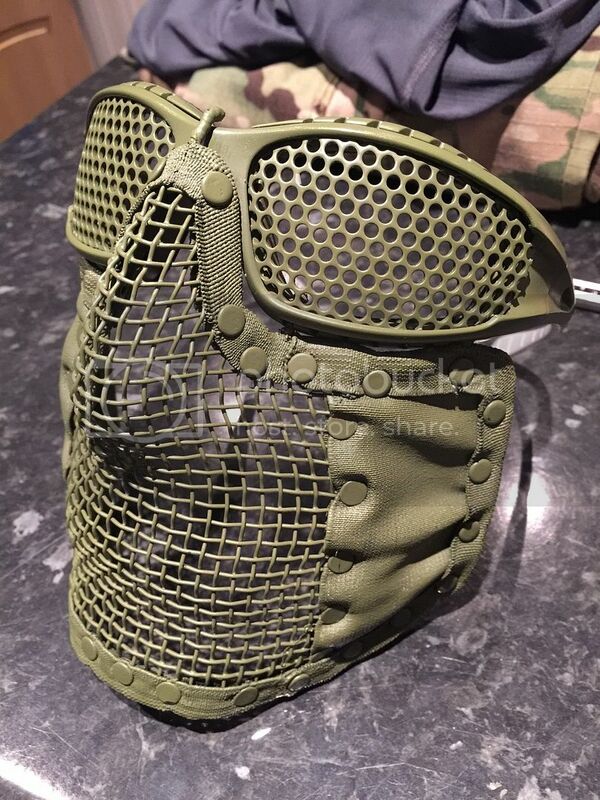 The mesh is #8 0.7mm SS316 and you can buy/blag sample sized pieces which are well big enough to do any twin lensed goggles and, from some companies, just about a ski mask type. I received my daggernose herosharks yesterday and the quality is absolutely fantastic! I originally had the large nuprol mesh goggles but I changed to these because I wanted a higher quality lower profile set of eyepro. I've found the nuprols to have a better and more comfortable full seal, however the herosharks aren't as dark as the nuprols and my vision is less obstructed. 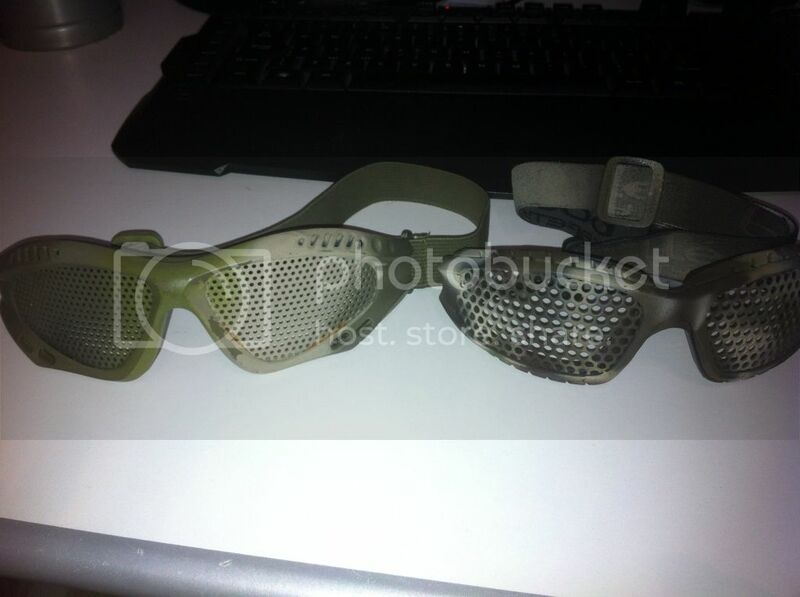 As others have said, the mesh is very strong and the goggles seem to be very durable. Overall, I'm very happy with my purchase and I would recommend herosharks. its strange but I never notice the mesh at all. All I see is the same as looking through sunglasses. If you put Nuprol ones next to Heroshark it's very clear that the Heroshark ones have larger openings and are less obstructive of your view - not sure if this is down to poor design on Nuprol's part or better materials in the Heroshark ones that mean the metal can be thinner, but either way Heroshark easily make the best ones out there. The main problem with mesh is the shadows it creates across your vision. If you haven't worn any, you will not know what I mean and unfortunately most cameras do not work the same way as the human eye so you cannot replicate the effect in pictures without some very expensive equipment. without any doubt Herosharks are the toughest mesh goggles available - they do not claim it, but i have no doubt that they would stop 00 buckshot. No way, buckshot is serious business! Yeah James, but that pot is continually getting annealed by being heated and allowed to cool slowly - they put dents in it with a BB gun they say at the top of the piece... probably .177/4.5mm steel BB's, but nonetheless, bugger all compared to buckshot. I dunno for sure that Herosharks would withstand buckshot mind, nor would i risk it, but i would put £10 on it if someone had a shotgun and some spare HS to test! Absolutely no way, mesh is by it's very nature quite weak to impacts (but easily strong enough for airsoft, before anyone comments). The holes tend to stretch and allow stuff through when hit with enough energy by something hard; like shotgun pellets, even if heroshark lenses were made of something ridiculously hard like tungsten I don't think it'd stand up to 00 buckshot.. Buckshot will go straight through 2-3mm steel without any issue, it'll easily go through car doors with enough force to kill people on the other side! I've spend years wearing the cheapy £10 Sansai Mesh Mask that retailers sell and never had any issues. I've played all through woodland and CQB in them. Every few months they need to be replaced if the strap starts to go; or the mesh comes loose from the housing. But, £10 for 5/6months is a good deal as far as I'm concerned. Never had any issues with the mesh being Unsafe. My current one has a couple of dents in the mesh, so I'll keep an eye on them. If they get worse then it's time to replace. But; nonl sign of anything trying to get through. At first it was a bugger looking through the mesh, but now I'm used to it. Just like wearing sunglasses. I get that a lot of people don't like the idea of mesh because it the weaknesses in it; but I've never seen any problems myself. Tried goggles and glasses and never got on with any of them.